Good morning to another bright and sunny day, although thunder storms are threatened for later. Still the garden is looking good and I have nearly finished organising it. So much so I have taken my recent photos outside. Well you know how I love sparkle, so when I saw Paperplay's challenge was flowers and sparkle I knew I had to design a card for that one. I also saw this sketch at Moving along with the Times and another theme of flowers at Charisma and Nordsalten Hobbyklub so I decided to combine them all. 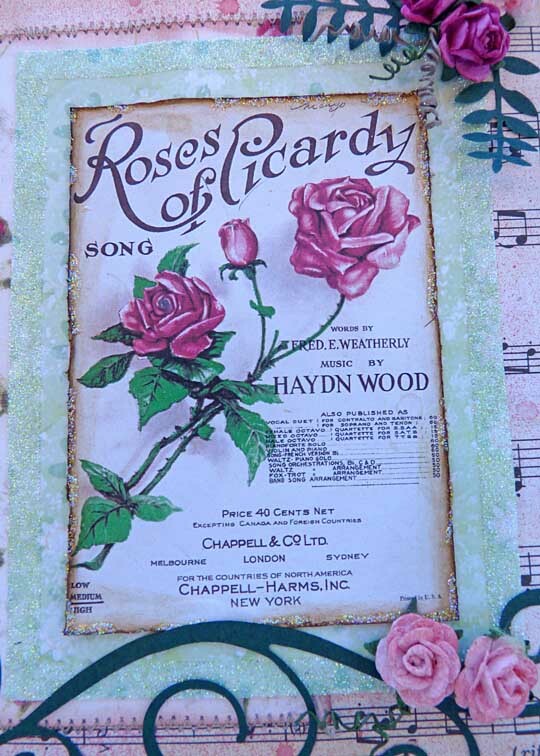 I had downloaded this gorgeous sheet music cover of 'Roses from Picardy' from Antique Images and a pink and green theme fitted perfectly, linking with the Creative Card Crew challenge. I have used two DPs and some sheet music for the backgrounds. I couldn't make one of my own frames to fit this so I used double-sided tape to frame the green paper and cover it with glitter. 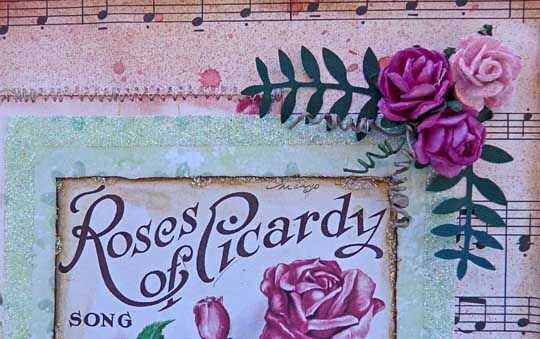 I distressed the image, the rose paper and the music paper and used stickles on the edges of two of them. The roses I had in my collection and I spritzed the lighter ones and the music paper with Tattered Angels water melon glimmer mist. I experimented with several things for the ribbon effect across the lower part of the page, but nothing seemed quite right until I die cut a long scroll shape to look like a stem effect for the flowers....... and so it all came together. Enjoy the weekend. Hopefully we will have a BBQ tonight and sit outside again, as we did last night with the family. Love the summer. You have a wonderful imagination and it shows in your cards. I absolutely love this card, the colours, the image and the gorgeous swirl all add up to a truly beautiful card. Just noticed you have applied for DT call. Good luck. I love your card, it's beautiful. Thanks for joining NSHKs challenge. Oh gorgeous card Brenda, beautiful details. Beautiful card Brenda, it's so pretty and I love the swirl. 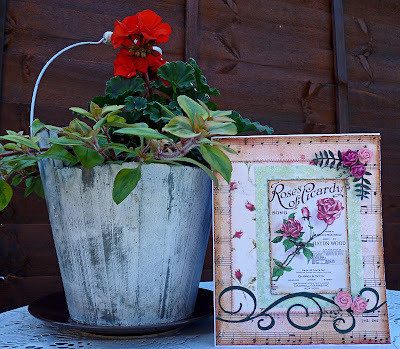 What a gorgeous card - I really like it! Thanks for joining us at Nordsalten Hobbyklubb this week! Thanks so much for playing along with Paperplay this week - adore your card.